Pancit lomi is a Filipino Chinese noodle dish made from thick fresh egg noodles or commonly known as miki. There are also varieties of miki depending on the thickness of the noodles. Unlike the popular lomi with a thick sauce, this recipe is a simple lomi soup this without the thickening agent. Its similar to chicken or beef mami containing noodles and soup stock. To cook pancit lomi; In a large casserole put in pork bones and pork belly. Cover with about 12 cups of water and cook over a very low fire. Season with salt. When pork belly is tender, remove from casserole and slice into 1/4 x 1/2 x 1 inch strips and set aside. Shell shrimps and set aside. Add the shrimp heads and shells to the soup stock and continue cooking. In a separate pan, heat 2 tablespoons cooking oil. Stir fry, sliced pork, shrimps, carrots, kikiam, squid balls and cabbage. Cook until vegetables are crisp tender. Add soy sauce. Peel shallots and slice thinly. Fry until lightly browned and crisp. In another pot boil water and drop lomi noodles. Cook for about 3 minutes. Put in a colander and rinse with cold water. Strain soup stock and add cooked lomi noodles. Serve soup and noodles in a bowl topped with the pork and vegetables. Sprinkle with the fried shallots and garnish with wansuy. See below for the complete recipe with exact measurements of ingredients. Pancit lomi is a Filipino Chinese noodle dish made from thick fresh egg noodles or commonly known as miki. In a large casserole put in pork bones and pork belly. Cover with about 12 cups of water and cook over a very low fire. Season with salt. When pork belly is tender, remove from casserole and slice into ¼ x ½ x 1 inch strips and set aside. Shell shrimps and set aside. Add the shrimp heads and shells to the soup stock and continue cooking. In a separate pan, heat 2 tablespoons cooking oil. Stir fry, sliced pork, shrimps, carrots, kikiam, squid balls and cabbage. Cook until vegetables are crisp tender. Add soy sauce. Peel shallots and slice thinly. Fry until lightly browned and crisp. In another pot boil water and drop lomi noodles. Cook for about 3 minutes. Put in a colander and rinse with cold water. Strain soup stock and add cooked lomi noodles. Serve soup and noodles in a bowl topped with the pork and vegetables. Sprinkle with the fried shallots and garnish with wansuy. 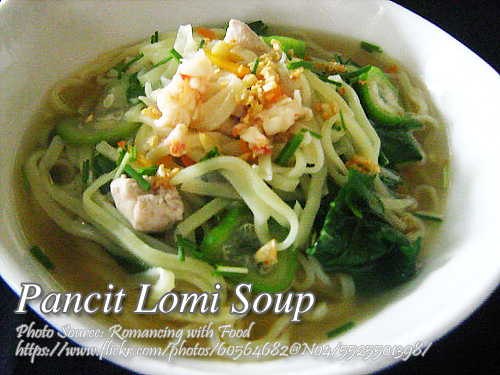 Thanks for this wonderful lomi recipe!